So, there is only one speaker on the bottom of the new iPhone's ? If true, what's behind that second speaker grill? 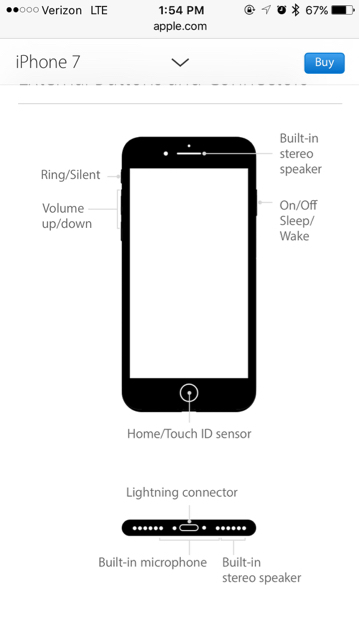 Re: So, there is only one speaker on the bottom of the new iPhone's ? Did Apple announce this during the keynote? I was under the impression that they were both speakers. They did not. We find all this stuff out via teardown. I can't be the only one that was thought there two speakers on the bottom of the new iPhone. I think this was a sneaky thing for Apple to do without saying anything about it. I'm pretty sure in the Keynote the video played refers to Stereo Sound through speakers at both the top and bottom of the device. Just what I remember. Could be wrong. They most certainly did show it and discuss it during the keynote. Did you not watch it? The idea is to turn the phone to landscape to hear the stereo. A speaker at each end. I did watch and saw the "Stereo" sound graphic coming from the bottom and earpiece of the phone. With the two grills on the bottom I assumed there were also 2 speakers on the bottom of the phone. So, everyone knew that second grill had no speaker behind it? Even more confusing is even if you hold it in portrait mode, you'll still get sound out of the bottom and earpiece just like you'd expect if you had it turned to landscape orientation. Guess it makes sense though. It would be a waste to put a second speaker in that bottom left spot. You'd just perceive it as louder not stereo with some separation. So at the bottom, just the right side gives sound? It sounds like both sides give off sound. Apple didn't try to fool anybody. Anybody who paid any attention to the Keynote would know that. They clearly said there were stereo speakers and that the ear piece functioned as one of them and that they gave stereo sound in the landscape orientation. There would be no benefit in stereo sound with both speakers at the bottom because of the lack of separation. I don't think any iPhones ever had two speakers at the bottom.Years ago when flip phones were the rage, phones boasted stereo speakers but with no DSP and maybe 2" of separation, it was just crap mono sound. Apparently Apple engineers are smarter than many people give them credit for. The holes on the left side of the phone are for symmetry, not shenanigans. Yes. There is only one speaker on the bottom, and it's on the right side. There is no right or left speaker, just one speaker on one side. Correct. There's no trickery on Apple's part. It's just the way our ears work. The very small distance between where two speakers would be wouldn't give any discernible stereo sound. You'd have two speakers giving you the same thing that one speaker does.